Available in flavours of coconut, caramelised almond and hazelnut praline, chocolate, mango, passionfruit, pistachio, rose, salted caramel, strawberry and vanilla. Wondering from where to order macarons online? The fancy French dessert that has both taste and elegance! 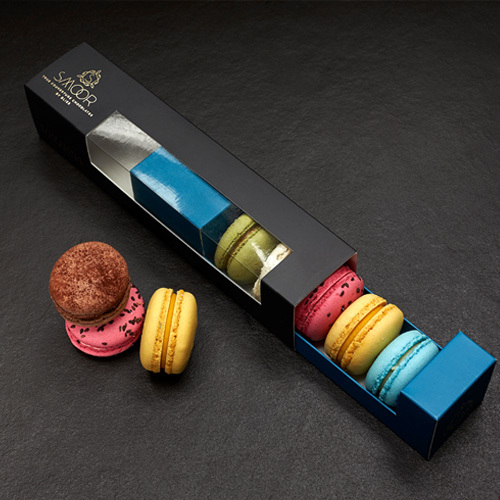 Buy macarons online from Smoor and let these perfect little tidbits melt your hearts. Containing rich and honest ingredients, we present you the best macarons in Bangalore. One of the top macaron online shop, Smoor offers you the yummiest macarons in Bangalore. These assorted delicacies come in boxes of 6 and in irresistible flavors of Rose, Strawberry, Salted caramel, Pistachio, Chocolate, Vanilla, Raspberry and Coconut and 12. Buy French macarons online from us and indulge in some serious sugar-crush! We offer you the best macaron’s price in Bangalore.